The army has confirmed the killing of three soldiers and four members of Boko Haram, and the arrest of four suspected terrorists in an attack on Daura Local Government Area of Katsina State, North-West Nigeria on Thursday. The authorities of the 3rd Brigade of the Nigerian Army in Kano said on Friday that four gunmen and three soldiers were killed during the Thursday’s attacks in Daura. 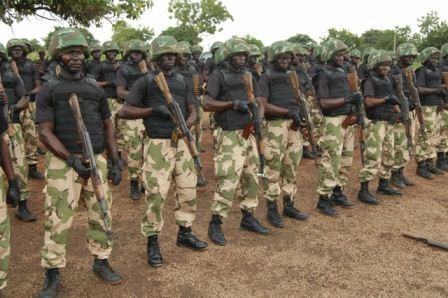 The Brigade Commander, 3rd Brigade of the Nigerian Army in Kano, Brig.-Gen. Iliyasu Abba, the terrorists attacked the Area Command of the Nigeria Police and a Divisional Police Station about 2130 hours on Thursday. “The terrorists proceeded to rob four banks also in the local government area,” he said. He, however, said troops of the 35 Battalion responded to a distress call and made gains against the terrorists. The commander said that a good number of terrorists escaped with gunshot wounds and two soldiers had injuries. Abba said items recovered from the terrorists included 11 AK 47 rifles, 73 magazines, 273 rounds of 7.62 ammunition and 118 rounds of FNW ammunition.